One of the things that I really appreciate about My Hero Academia as a TV series is the lack of filler episodes when compared to the likes of other fan-favourite, long-running shonen series like Naruto and Bleach. Unfortunately, that filler had to come some time, and it does so in the form of this 96-minute movie. While this movie is not something I hate, I certainly didn’t like it as much as I thought I would. The first five and last ten or so minutes are excellent, but the meat that holds the bread together is very bland and pretty much fills the template of a Shonen Jump movie. 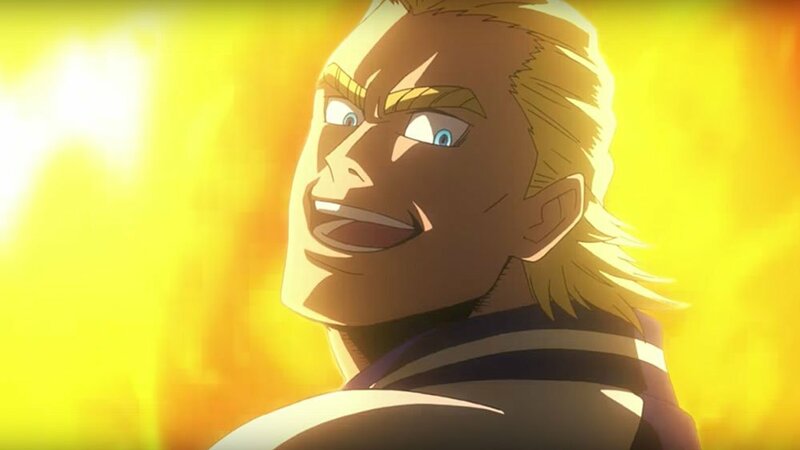 The fantastic introduction to the film is really set to whet fans’ appetites, as we take a brief look into All Might’s past during his university days in the United States. 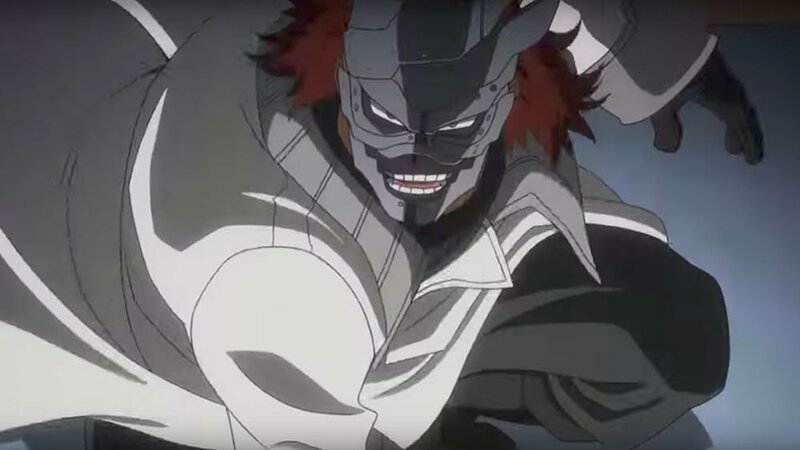 It’s a great action set piece that shows All Might battling some monstrous-looking villains back when he was in his prime and also introduces for the first time his support partner David Shield. While the film certainly stars the rest of the My Hero Academia cast, its core premise is about All Might and David Shield’s friendship and how All Might’s decline from the glory days shown here affects his close friend. Now a famous inventor and maker of hero support items, David lives with his daughter Melissa on I-Island, a serene yet secure technology campus floating in the open ocean. Any support item worth its weight has probably come from I-Island, and indeed from the mind of David Shield himself. While people don’t normally get the chance to visit the island, the large I-Island Expo provides a rare opportunity to see the latest in hero support tech. With select invitations going out to the world’s top heroes, our familiar cast find themselves at the expo due to one reason or another, whether tagging along with someone, as Midoriya is doing, or representing their parent as Todoroki is doing, stepping in for Endeavor. 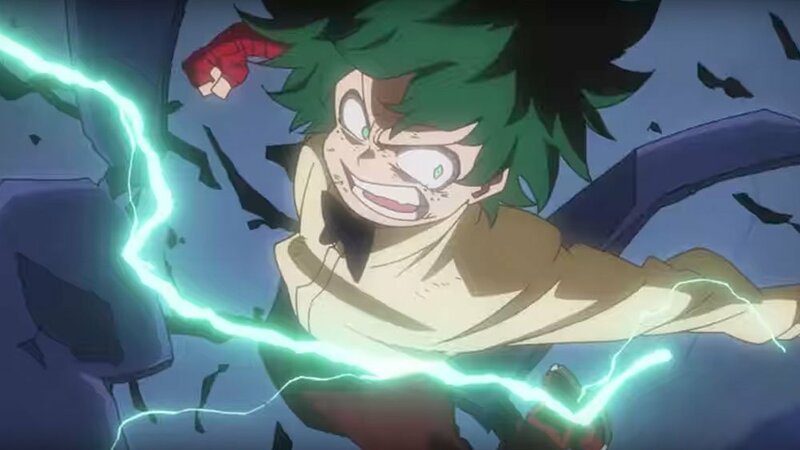 The approach that the film has taken leaves it open for people who have never seen My Hero Academia before and jumps in with some light flashbacks from the TV series explaining who Midoriya is and why he wants to be a hero. With the film set in-between Seasons 2 and 3 of the TV series, it’s nice that someone who is watching for the first time can get a sense of what the show is about and who everyone is. However, the way the characters are introduced could have been done a lot more effectively – this particular sequence felt overly long and spent too much time drumming up reasons for why certain characters were there. A potential solution to refining this and making it less awkward could have been to present the adventure as a school trip for the kids to see what real hero support items are like. This would have made more sense when the rest of Midoriya’s classmates are at the expo anyway – several are only given bit-parts due to them not being invited to the exclusive launch party on the evening before the expo truly opens. Things start to get more exciting at the party, when a group of villains attack just before Midoriya and the gang arrive. With All Might and the other pro heroes out of commission, it’s up to them and Melissa to ascend I-Island’s central tower and turn off the security system that is keeping everyone hostage. This section felt like the real meat of the film and was more of what I expected from this as a Shonen Jump movie, as the gang scales the tower, trying to find their way past security doors, robots and the villain’s henchmen. While there’s a couple of cool battles here, what I found most interesting was how it showcased everyone’s different abilities and didn’t leave anyone out of the action. 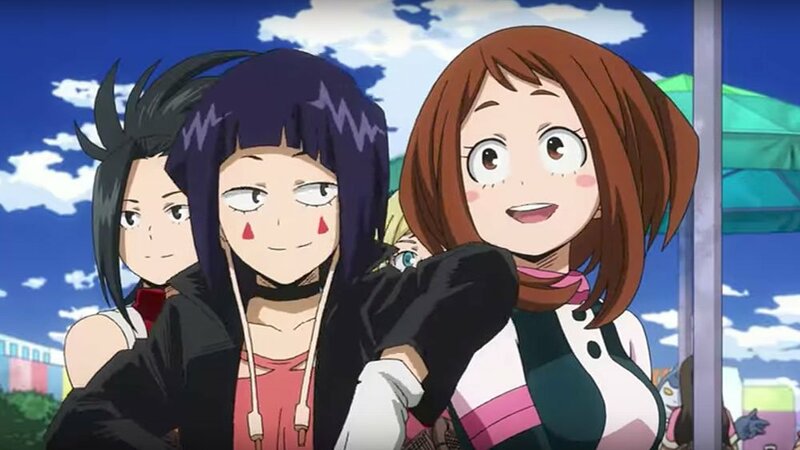 While there are some of Midoriya’s classmates left on the sidelines, the ones that take the main roles here have been thought out and take them for a reason: Bakugo, Todoroki and Kirishima handle the brunt of the combat; Uraraka, Iida and Midoriya himself are more mobility-focused and are good at moving through the tower quickly; Yaoyorozu plays towards defence and Jiro’s earphone jack ability is good for both scouting ahead and monitoring their surroundings. While Kaminari and Mineta are still played for laughs, they do make their own contributions – Mineta particularly shines in one scene, using his hair blobs to scale a wall nobody else could climb. While this section is light on plot and focused on the action sequences, the story finally gets rolling again when Midoriya and Melissa reach the top of the tower. While there can’t be any major developments as the film can’t affect the franchise’s main story in any way, it does start to tie the most recent two TV seasons together, pitting the ideals of those who are stuck in the past and want to relive the good old days against the rise of a new generation with their own different ideas of what it means to be a hero. As we hit this climax, the film takes a turn for the better, ending with a clash between the villain and our bunch of heroes that pairs up Midoriya and All Might in an amazing battle scene that we have been waiting for, for some time. It’s clear that a lot of the animation budget was saved for this scene, as we see the action become more dynamic, with a greater variety of effects and shot types. The rest of the film (apart from the opening prologue) is rather drab in comparison and doesn’t do the franchise justice, often looking worse than the TV series. While I-Island itself is colourful, the majority of the film is spent running through dull, grey corridors and darkened rooms, with very little to do in the background department. Even in the earlier I-Island scenes, detail is sparse, particularly when you look at characters in long shots. Thankfully Yuki Hayashi’s soundtrack to the film is very much up to scratch, using a lot of the music from the main series that will please fans who will be able to identify some of the more punchier battle themes. The Japanese voice cast still does a lot of great work, and I personally prefer the Japanese to the English dub, the latter of which just doesn’t gel with me. The mispronunciation of character names is a particular annoyance, which seems more to do with the ADR direction than the delivery from the voice actors themselves. It’s clearly been Americanised, and I occasionally did not understand what some characters were saying or who they were referencing because of it. 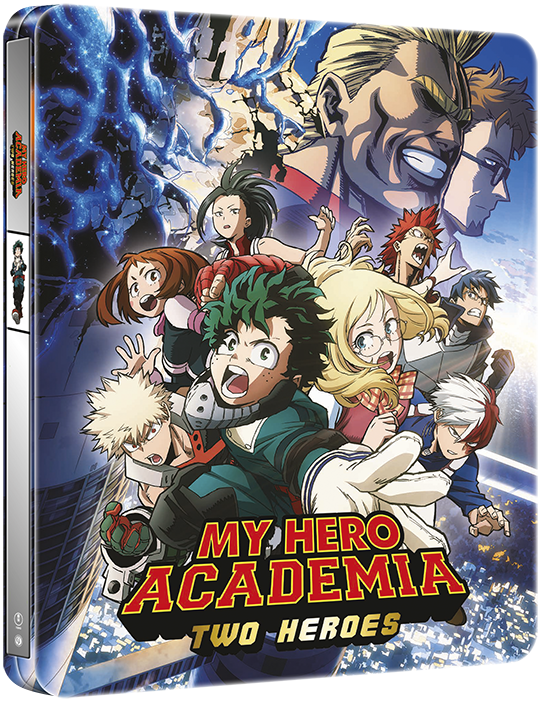 Manga Entertainment’s release of the film comes in three flavours: a limited edition SteelBook Blu-ray, a standard Blu-ray, and a standard DVD. All releases carry the Japanese dub with English subtitles and the English dub, and there are no extras to speak of with this release. 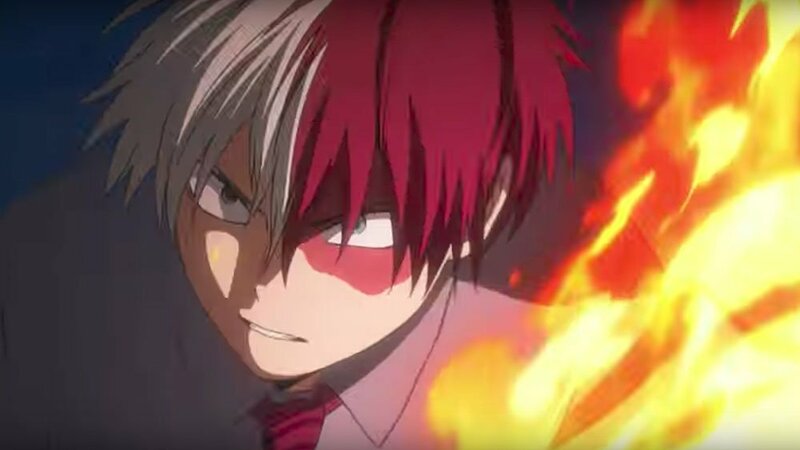 Overall, My Hero Academia: Two Heroes is a standard franchise film that gives a bit more of the series to the fans eagerly awaiting the next instalment. As a result, I don’t think this is something someone would be interested in unless they’ve seen the anime or read the manga, even though it does try to be more open to newcomers. While it does spend too long on introducing all the different characters and setting the scene, once it gets going, it proves to be a decent experience, with the true highlights being the prologue involving All Might’s past and the climactic battle at the very end. If you are a fan, this might be worth getting just to see those scenes, but otherwise it doesn’t do anything special and, with no real impact on the series as a whole, you’re not missing out if you do pass up on this.